Every flower is lovely (excepting perhaps flowers that smell bad) but some flowers get a bad reputation from being used poorly repeatedly over time. 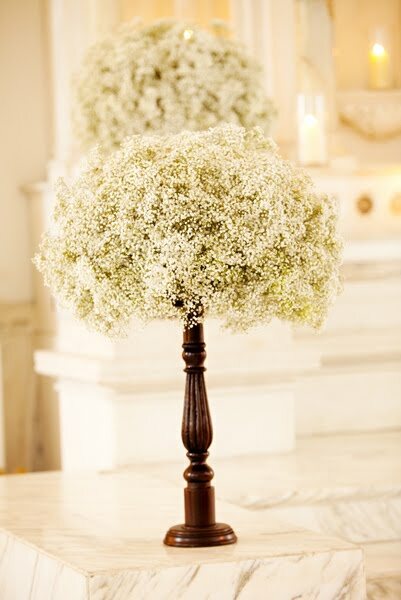 The best examples of this are carnations and gypsophilia, or baby's breath. 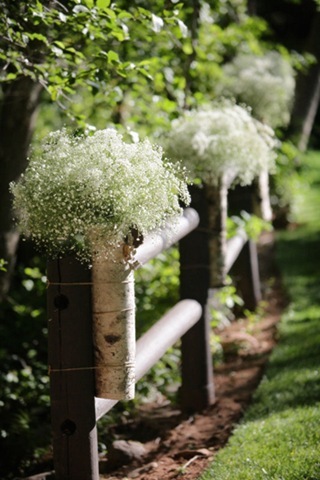 The problem with the usual application of baby's breath is that it plays to its weaknesses rather than its strengths. People often attempt to "artfully scatter" baby's breath amongst things, and a single stem of gypsophilia will always look rather naked. The true beauty of this flower is best showcased en mass. FYI, the most common varieties of gypsophilia are bambino, cassiopeia, million stars, new love, mirabella, orion, and perfecta. Yeah, I'm one of those people who hates carnations and baby's breath in most typical, store-bought flower arrangements. I have to say, though, that I adore these photos of them in bunches. They look like pretty, fluffy, puff ball clouds but in an elegant way and I really dig it! Who knew!? It makes me want to find a reason to need some.